Found at Sculthorpe Moor. Approximately 3 feet across growing in marshy fen. Unable to get close to fungus as growing on the other bank of a dyke. 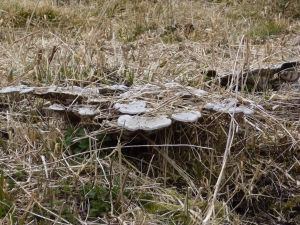 I presume the fungus is growing on a tree stump, but it is not visible. On close up appears to have stipes underneath the caps.